You forced me to look up the difference betw. Swiss chard and Kale. I grow and love rainbow chard-a bit finer than kale. There’s your first item in next summers’ veggie patch, rainbow chard. Someone suggested kale+garlic+olive oil is the BEST. You shall be the judge. Kale is a member of the broccoli family actually and is quite good sauteed with bacon, madeira, garlic, and some raisins or craisins thrown in at the end. It’s also easy to grow and is frost tolerant. It’s rich in folic acid and lots of other good vitamins. 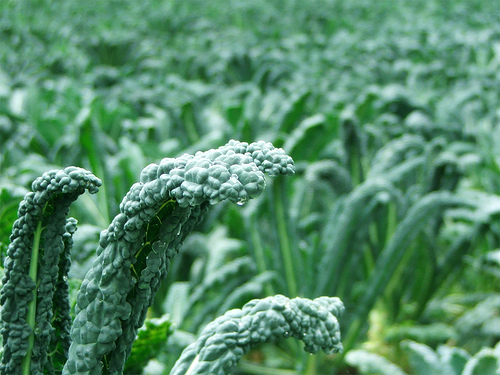 We grow kale and it’s ubiquitous in the stores here in md. Typically you don’t eat it raw unless you are dad and eat the garnish off the plate at lil johns. Good idea! I still have that 1/3 of a bunch left over! As you could probably guess.. I have never even seen kale before! Previous Previous post: I drive my Suzuki in Gucci Heels.